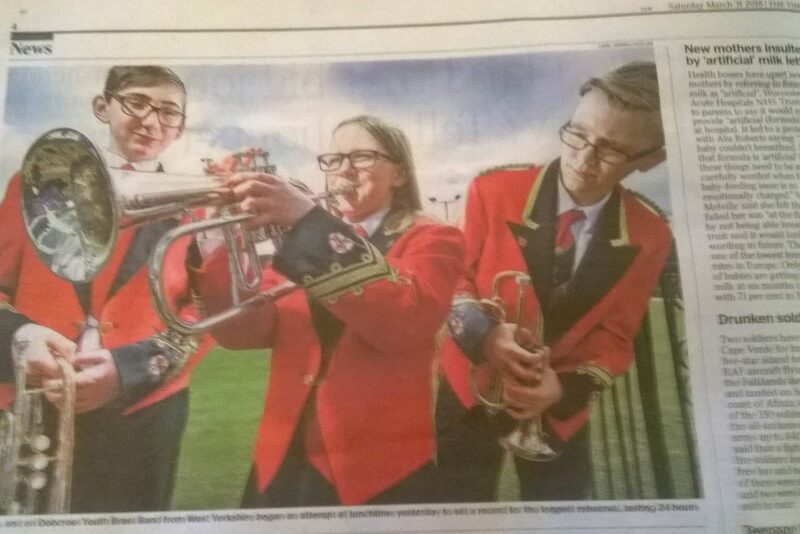 A rainy Whit Friday might have meant smaller crowds – but it also put Dobcross Youth Band in the national news again! The Daily Telegraph featured a large picture of some of our players in their rain capes on page 5 the following day. This follows on from coverage of our 24-hour rehearsal in both the Daily Telegraph and the Times back in April and we’re really pleased to have brass banding and our lovely village getting this sort of exposure. Despite the weather, all our players enjoyed the morning procession and the Youth Band had a fantastic evening of contesting. They managed to play at 10 contests and were particularly thrilled at the brilliant reception from the crowds here in Dobcross and also at Delph – many thanks to everyone who supported them. An extra bonus was second place in the youth section at the Heyrod contest. You can see lots of photos from the night on our Facebook page.